Probate* 30 Aug 1830� A probate action was taken on his estate on 30 Aug 1830 at Currituck Co., North Carolina. Jno Culpeper, 29, M, Wh, No Occ., NC. That Stephen Decatur Culpepper was the son of Archibald and Mary 'Polly' Culpepper is proven from Stephen's death record in Norfolk County. Research note* 3 Jun 2004� Both Thomas Culpepper and Thomas Edward Culpepper of Norfolk Co., VA appear to have been active at the same time, in this area. That Thomas Culpepper was the son of Peter Culpepper is not entirely certain. Family tradition suggests that Thomas Edward Culpepper of Norfolk Co., VA corresponds to most of the known records. Further research is needed. 1840 Census* 1 Jun 1840� Nancy was listed as the head of a family on the 1840 Census on 1 Jun 1840 at Currituck Co., North Carolina. That Nancy was a McCoy is based on Camden Deed Bk O-340. Nancy Culpepper, 1 M0-5, 1 F5-10, 1 F20-30, 1 F50-60, 0 slaves. Polly Powers, 64, F, Wh, Farming, RE=$1100, PE=$1500, NC. Crawford Culpepper, Son, M, Wh, Feb 1889, 1 (sic), sng, NC/NC/NC. Shepherd Lee, (13 Dec. 1855-10 Oct. 1938) listed as a Culpepper in 1860 census in household of Hardy Culpepper, Jr. was son of Mary Bundy and her 1st husband, James Jordan Lee.... Shepherd Lee marr. 4 Jan. 1877 (has been transcribed as June) Mary Poyner, daughter of Robt. Poyner, at Moyock. 1 child: Lillian Lee. 2nd Marriage: 15 August 1880 to Jakie Frais (31 May 1853-9 May 1940) dau. of David & S. Frais, at Moyock. Children: Thomas E., Virginia C., Bruce and Katie Lee. Mary J. Bundy, daughter of Christopher & Rachel, born 23 Dec 1837. Alice Cox, 9, F, Wh, NC. Shepherd J. Lee, son of James Jordon Lee & Mary, born 13 Dec 1855. Hardy Culpepper, Male, married Mary Lee on 4 Mar 1858 in Currituck Co., NC. John P. Culpeper, son of Hardy Culpeper & Mary, born 11 Oct 1855(8). James W. Culpeper, son of Hardy & Mary J., born 25 Jun 1864. James W. Culpeper died 3 Oct 1868. Delila Culpeper (2-p), Female, White, born 1853-1854, died 7 Dec 1926 in Moyock, Currituck Co., NC. Joshua Culpepper, Other, M, sng, Wh, 21, Laborer, NC/NC/NC. Mollie G. Rea, Mother, F, Wh, 55, Md, OH/Germany/Germany. Registration State: Ohio; Registration County: Madison; Roll: 1832512. Charles Wesley Culpeper, age 26, Hickory, VA, born 10 Feb 1891 in Gertie, VA, Farming for self, No dependents, Caucasian, No prior military service, Claims no exemption from draft, Medium Height, Medium Build, Light blue eyes, Light brown hair, not bald, no physical disqualifications; registered 5 Jun 1917 at Balls Mill, Norfolk Co., VA.
Walter Bryan Culpeper, age 21, RFD#1, Hickory, VA, born 9 Aug 1896 in Bethel, VA, Carpenter for Porter Bros. at US Army Base in Norfolk, VA, Dependents: Father & Mother, Single, White, No prior military service, Claims no exemption from draft, Medium Height, Slender Build, Brown eyes, Black hair, not bald, no physical disqualifications; registered 5 Jun 1918 at Courthouse, Norfolk, VA.
Willie C. Culpeper, Son, Wh, M, Nov 1883, 16, S, VA/NC/NC, Day Laborer. Walter Culpeper, son, M, Wh, 13, S, VA/VA/VA, None. Lena M. Culpeper, Daughter, F, Wh, 26, S, VA/NC/NC. E-mail written Jul 2007 to Warren Culpepper from Kathryn Scott Stevenson, Twin Falls, Idaho, e-mail address. Dates of birth and death from the Scott family Bible. William B. Jones, Nephew, M, Wh, 15, sng, VA/VA/VA. Date death from the Scott family Bible. H W Culpepper, Male, married H E Powers in 1880 in Currituck Co., NC. William Henry Culpeper, White, born 8 Nov 1883 in Norfolk, Virginia, residing in Madison, Ohio, registered 27 Apr 1942. Crawford Culpepper, RFD#2, Fentress, Norfolk Co., VA, age 18, born 23 Feb 1900, White, Laborer for Porter Bros at US Army Base in Norfolk, VA; Nearest relative: Henry W. Culpepper, RFD#2, Fentress, Norfolk Co., VA, Medium Height, Medium Build, Brown eyes, Dark hair, no physical disqualifications; registered 12 Sep 1918 at Portsmouth, VA.
James Redic, Hired Man, M, Black,18, S, VA/VA/VA, Laborer-Home Farm. Registration State: Virginia; Registration County: Norfolk; Roll: 1984910. 1840 Census* 1 Jun 1840� Mary was listed as the head of a family on the 1840 Census on 1 Jun 1840 at Currituck Co., North Carolina. Mary Culpepper, white, female, died 5 Oct. 1870, Pleasant Grove Township, old age, 78 yrs. Parent or parents(?) J.B. or J.& B. Fisk, Norfolk Co., widow. Ref: Norfolk Co., Va. Death Register. Mary was listed in son, Stephen's household in Pleasant Grove Twp. 1870 census [and was blind]. 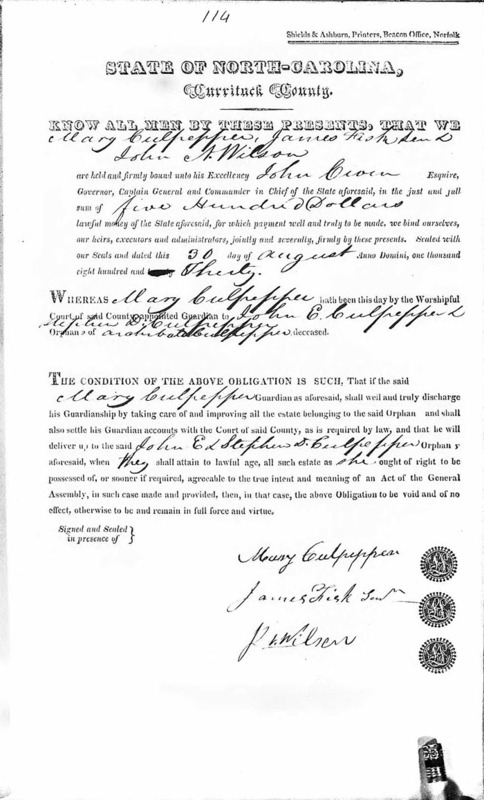 James Fisk was witness with Samuel Powers to Henry Culpeper's will 23 Nov. 1815, Curr. Co.
Daniel McPharson will 20 Sept 1797, Curr. Co., NC Daughter, Betsy Fisk. James Fiske and Mary Powers were witnesses to Joshua Cherry's will on 19 Mar 1805. Curr. Co. Joshua's wife was Lydia. I tend to believe Mary was daughter of James Fisk and Elizabeth (Betsy) McPherson, I need to check Norf. Co. for James Fisk will. Last N.Co. will book I have is WB III 1788-1802. James Fisk and Samuel McPherson were witnesses to William McPherson's will 20 Oct. 1791. 20 July 1795. Norfolk Co. This William had 2 children: Frances and William. He left William property lying in Curr. Co., NC. Martin Culpepper, 19, M, Wh, Laborer, NC. Polly Culpepper, 1 M5-10, 1 M10-15, 1 F30-40, 0 slaves. John Humphries, Jr., 17, M, Wh, NC. 1840 Census* 1 Jun 1840� Stephen was listed as the head of a family on the 1840 Census on 1 Jun 1840 at Norfolk Co., Virginia. Lydia Culpeper, 2, F, Wh, NC. Caleb Culpepper, 8, M, Wh, NC. J. A. Culpeper, 2/12, M, Wh, NC. Book 27, p. 203, Currituck Co., NC: 8 Aug 1854. Mary Culpepper of Norfolk Co., VA, but recently of Currituck Co., NC, for love and affection to my two granddaughters Polly Culpepper and Lydia Culpepper, daughters of my son Stephen Culpepper, a bequest of various items. Witnesses: Stephen D. Culpepper and John Culpepper. 1840 Census 1 Jun 1840� Susan was probably a free white female, age 15 and under 20, in Stephen Decatur Culpepper's household, on the 1840 Census on 1 Jun 1840 at Norfolk Co., Virginia. Susan Culpeper; widow Stephen D; 248 Charlotte; Norfolk VA; 1888. John R. Culpepper, Son, M, sng, Wh, 18, Work On Farm, NC/NC/VA. J. R. William Funeral Home, as provided by Alice Doak. [Note: In 1889, the 3-p John R. Culpepper is at the same address as the 2-p Richard J. Culpeper was in 1888. Also, since no Richard J. Culpeper or Culpepper can be identified in the Culpepper family tree, we believe Richard J. and John Richard to be the same person.]. 1840 Census 1 Jun 1840� John was probably a free white male, age 15 and under 20, in Mary Fiske's household, on the 1840 Census on 1 Jun 1840 at Currituck Co., North Carolina. Book X, p. 219: 30 Apr 1840 — Nelson R. Cartwright to Benjamin F. Culpepper, for $2,000, the Gabriel Taylor tract, consisting of 100 acres. 1840 Census* 1 Jun 1840� Benjamin was listed as the head of a family on the 1840 Census on 1 Jun 1840 at Camden Co., North Carolina. Research note 31 Oct 2011� The children of Nicholas Culpepper of Camden Co., NC are unproven. The 1810 census shows that he had three sons born between 1800 and 1810. Benjamin Franklin Culpepper has been assigned as a son of Nicholas because of their association with each other in Camden Co. NC deed records, and because of the apparent use of the name Nicholas among descendants of Benjamin. Accountis Culpepper was onced speculated as a son based on his being the right age and in the right location. His son Joshua might indicate that he was a son of Joshua rather than of Nicholas, but Joshua's known children were all born before 1800, and Accountis was born around 1805. In any event, Accountis DNA testing now suggests that Accountis is a member of the Thomas/William branch and not of the Henry III/Henry IV branch that Nicholas descends from. N. (Nicholas) Culpepper, 3 M0-10, 1 M45+, 3 F0-10, 1 F10-16, 1 F45+. Nicholas Culpepper, 2 M0-10, 1 M10-16, 1 M16-26, 1 M45+, 3 F10-16, 1 F26-45. Benjamin F. Culpepper, 1 M10-15, 2 M20-30, 1 F5-10, 1 F20-30, 1 slave. 1840 Census 1 Jun 1840� Nicholas was probably a free white male, age 10 and under 15, in Benjamin Franklin Culpepper's household, on the 1840 Census on 1 Jun 1840 at Camden Co., North Carolina. Norah Ceil, 25, F, house work, NC. Mary Culpeper to marry George Sykes, Bond Date: 25 Jul 1865 in Craven Co., NC, Record No. 03335, Bondsman: C W Walker, Witness: C J Morris, Bond No. 000029903. Mary Culpepper, 14, F, Wh, At home, NC. John Daw, Cousin, M, Wh, 30, sng, NC/NC/NC.